I was standing on the edge of small tree platform high above the Jamaican rain forest, looking down at all the treetops. About eye level with the birds. With the forest canopy beneath me, the guides from Chukka Tours expertly snapped all the hooks and cables in place and I could feel myself about to shout out, “I don’t want to do this, Man” ! Thankfully before I could, one of the women leaders placed a reassuring hand on my shoulder, told me to sit in my harness, and gently pushed me out into wide open space. Sailing, soaring above the trees, flying, zipping along a cable, gathering speed and …making a soft landing onto the next tree platform, welcomed by a pair of strong, brown arms. What a hero, I thought. Only next time I’ll remember to breathe. And so on to the next eight flights, combinations of vertical heart- stopping drops and wonderfully exhilarating runs that had me remembering a long, long time ago when a primal self flew from tree to tree, without a cable and without fear. Well, not exactly, but it was a fun image. Canopy Tours or Ziplining are becoming very popular, though certainly not mainstream and still an exotic form of Adventure Travel. Our next Ziplining experience, in Nicaragua, was launched from a rugged mountain complete with incredible views of lakes, birds and jungle. In fact we made a fun one-minute Travel Video PostCard of the experience. The Ziplining industry has all the information you’ll ever need and some fun videos. The principle is pretty simple: you basically swing or zip from tree to tree on a series of cables strung above the jungle canopy. The equipment, thankfully, is sophisticated. Guides are skilled – or should be – in arranging an intricate series of harnesses, pulleys and Karabiners, a mountain climbing tool that’s basically an oval-shaped snap link, used to attach the harnesses and pulleys. 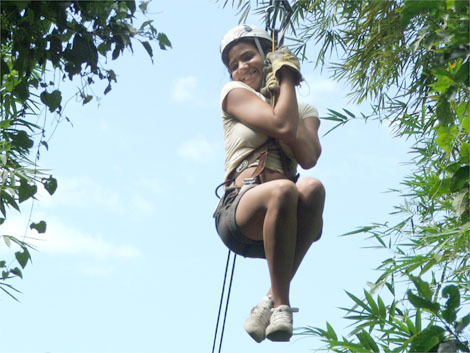 Mexico, Costa Rica and Nicaragua, Jamaica and even New Hampshire all have Canopy Tours which while similar, vary slightly depending on the contour of the jungle and the quality of the arrangements. In Nicaragua and Jamaica, for example, the guides are also well trained in the flora and fauna of the region, so the experience is filled with interesting explanations of the island’s varied and vibrant flowering trees and vegetation. How long is each “throw” or traverse? They range from 105 to 700 feet apart, and then there are those straight-down vertical drops that will have you screaming. But that’s part of the fun. I think. http://www.adventuretravelshop.co.uk What fun! A great thing to do whilst on a family adventure holiday. Lol… you should proberly change the title!! I came here for the wrong advice!